When the National Museum of African American History and Culture (NMAAHC) opened its doors on September 24, 2016, it became the 19th and newest museum of the Smithsonian Institution. Established by an Act of Congress in 2003, NMAAHC is the only national museum devoted exclusively to the documentation and celebration of African American life, history, and culture. However, the far-reaching efforts to create a museum that highlighted and promoted the contributions of African Americans on a national level spanned a century. In 1916, a group of Civil War veterans convened in Washington, D.C. to discuss constructing a monument in honor of the African American soldiers who fought in World War I. In a sense, this was the inception of the plan to build what would one day become NMAAHC. In 2003, when Congress passed legislation to establish the museum, it had to be built, literally, from the ground up—there was no funding, no land, no building, and no collection. The Smithsonian had to apply to Congress annually for federal appropriations to help build the Museum. In the end, federal funding accounted for approximately $270 million of the $544 million budget. Corporations, foundations, and individuals united and provided $274 million toward constructing NMAAHC. The Museum established a membership program as an early effort to gain financial and public support. This type of membership-based fundraising effort was unique for the Smithsonian Institution considering there was no physical space to visit yet. The Museum welcomed contributions of any amount. The initiative served two purposes. In addition to raising money, it was a promotional endeavor. Members received updates on the Museum and shared their excitement about its upcoming opening with colleagues and friends. What started as a grassroots effort has resulted in NMAAHC having the largest active individual membership program of all the Smithsonian Institutions, with contributions ranging from as small as $25 to more than $1 million. In addition to fundraising, it was essential to find a worthy location for the Museum. The site selection committee considered four areas in Washington, D.C. as possibilities. After deliberations, the government endorsed a location on the last available plot of land on the National Mall. The building stands there today at the corner of 14th Street and Constitution Avenue, Northwest—next to the Washington Monument and across from the National Museum of American History and the White House. Symbolically, its prominent location on the Mall represents inserting the important role African Americans have played in the country’s history and culture into the national narrative. Its mere physical presence is a daily visual reminder of the Museum’s mission. The exterior of the building purposefully conveys a similar message. The Museum’s ornamental bronze-colored lattice façade pays homage to the intricate ironwork gates and fences crafted by enslaved Africans in the South. The bronze color stands in contrast with the traditional and popular sandstone façades that envelope many building exteriors in Washington, D.C. This was a deliberate choice by NMAAHC’s founding director, Lonnie G. Bunch III. He explained that America has a shameful past in relationship to many of the people who helped build the country; the color of the exterior serves as a reminder of the stain on this country’s history. Along with lacking a budget and a building, the Museum was founded without a collection. When NMAAHC began to build a collection, the staff knew it was critical to find objects that would tell a national story. It was important that the objects conveyed America’s complex narrative, as well as the invaluable contributions and inextricable connections of its citizens. As the director raised funds, curators and museum specialists traipsed across the country searching for hidden treasures to build the Museum’s permanent collection. Despite starting with nothing, NMAAHC currently has almost 40,000 objects and over 30,000 photographs, including several hundred films in the permanent collection. There are currently 3,000 objects on view within 13 inaugural exhibitions. There are also 15 interactive programs, 130 videos, and 11 audio programs housed on the five floors of exhibition space. The Museum’s mission is to preserve African American history and culture, so when building the initial collection, curators emphasized the importance of telling visitors layered stories through a range of objects. In order to do this, NMAAHC staff actively sought to increase the Museum’s collection through a variety of means. One of the most rewarding ways of finding possible collection items was through a program called, Saving our African American Treasures. During the program, Museum staff traveled to select cities throughout the United States, such as Detroit, Chicago, Ft. Lauderdale, Los Angeles, and New York and encouraged people to find treasures in their homes. Curators, museum specialists, and conservators taught people about various ways to preserve and care for their beloved family heirlooms. The program was primarily educational, but it helped spread the word about the NMAAHC at a time when it was still being built. A by-product of the Museum’s presence in various cities during the Treasures program was generating awareness about the Museum. Additionally, on occasion, people who attended the program offered rare and hard-to-find objects to the Museum to help build the permanent collection. 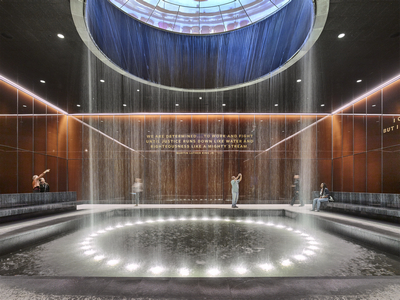 Now a permanent fixture on the National Mall, NMAAHC is organized into three pillars, or subjects—history, community, and culture—which take up five floors and nearly 500,000 square feet of space. The Museum’s three sub-floors, or the history gallery, serve as the foundation of the museum and anchor visitors by helping tell what historian John Franklin called “the unvarnished truth.” The floors narrate African American history through the stories of slavery and freedom, Jim Crow segregation and the civil rights movements, and struggles and achievements from the riots of 1968 to the 2008 election of Barack Obama. Thus, the Museum shows how the African American story is an American story. Above the history gallery, other areas of the museum focus on community and culture, and allow curious visitors to delve deeper into different topics. The top two floors showcase exhibitions on sport, theater and film, music, education, religion, the military, and visual art. The “Explore More” floor, contains the library, educational classrooms, the Robert F. Smith Family History Center, the Earl W. and Amanda Stafford Center for African American Media Arts, and numerous interactive activities. There is also a special exhibition space that offers temporary exhibits like the current show on Oprah Winfrey. Through all the exhibitions, interactive spaces, and areas for reflection and contemplation, even the cuisine cooked in the cafeteria, the museum seeks to craft an experience that takes the visitor on a journey of trials and triumphs. NMAAHC offers something for visitors of all ages, races, ethnicities and nationalities. It retells an American story by including people and communities that have been ignored or regulated to the margins of the history books for too long. This national desire for inclusion is reflected in the overwhelming support the Museum has received since it first opened its doors almost two years ago. 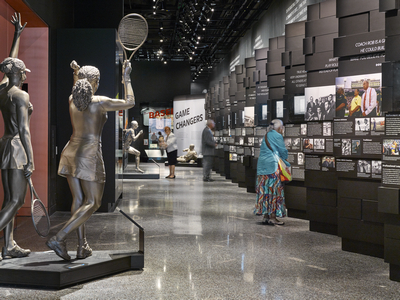 To date, the Museum has welcomed more than 3.5 million visitors who have come to experience the dynamism of the African American odyssey and learn more about a people’s history that is full of strength, resilience, and fortitude.